Tehiyah’s developmental kindergarten program establishes a solid foundation for each child’s future work in the major subject areas as well as in the fundamentals of appropriate social behavior. 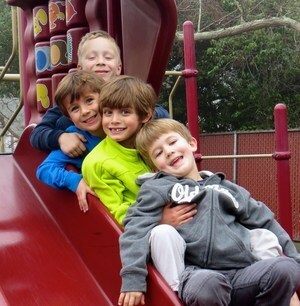 The kindergarten classrooms feature a fully integrated Judaic studies and general studies curriculum, in which two teachers teach side-by-side all day, creating classrooms rich in American and Jewish stories, songs, traditions, and Hebrew language. In each subject of the first-grade curriculum, as well as in their social, emotional, and ethical development, first-graders build upon the fundamentals they learned in kindergarten. By the end of first grade, children are comfortable with the basic building blocks of an elementary education: reading, writing, addition and subtraction, hands-on scientific exploration, and age-appropriate social interaction. Students have separate teachers for general studies and Hebrew/Judaic studies. Hebrew and Judaic studies are integrated using the TalAM Hebrew & Heritage Curriculum. Throughout second grade, students solidify their skills in the fundamentals of reading and writing (in Hebrew and English) and arithmetic. Students also explore more advanced concepts, such as sentence structure, story revision, multiplication and division, and the scientific method. 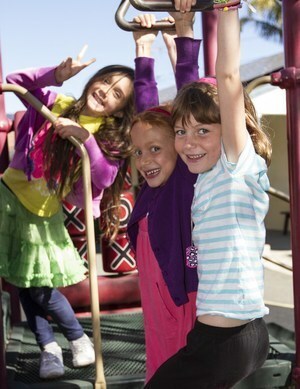 A real highlight of second grade is the focus on the cultural diversity of the Bay Area. This curriculum includes a variety of field trips in addition to the language arts, social studies, art, and music activities. In Judaic studies, in addition to their continued work with theTalAM curriculum, the climax of the year is the Chaggigat ha-Siddurceremony where each student receives his/her own siddur (prayer book) in a community celebration. Third grade is a time of transition for children. Third-graders are full of enthusiasm and curiosity and, with their improving literacy skills, they can begin to discover and pursue their own areas of interest. Students are offered greater challenges, and are given options for how to meet them. In Judaic studies, students are introduced this year to the midrashim and, for the first time, read directly from the Chumash. Projects are developed in a variety of subject areas that allow all types of learners access to the material, and learning that goes beyond the classroom forms an essential part of this program. 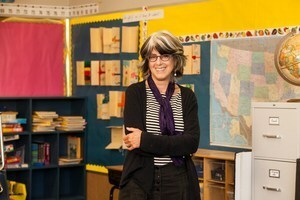 Fourth-graders, increasingly confident and abstract thinkers, are ready to delve into more complex areas of study, such as learning about history and current events, developing their own math games, writing a research report, grappling with the theme of a story, reading Biblical commentaries, and using the scientific method to carry out a comprehensive experiment for an independent science project. Since fifth grade is a transitional year between lower school and middle school, the year’s emphasis is on effective study skills and personal responsibility. As fifth-graders learn about the nascent years of America, they draw parallels to their own experiences with freedom and responsibility. Freedom and responsibility are also important topics as they begin an in-depth reading of the book of Exodus (Sh’mot). As much as possible, projects are developed to allow for cross-curricular study, and opportunities are created for all types of learners to show mastery of the material and engagement with the curricula.